Norwegian Bliss, the first cruise ship custom-built with features and amenities for the ultimate Alaska cruise experience, has departed Meyer Werft in Papenburg, Germany. The ship has begun her conveyance along the Ems River, arriving to Eemshaven, Netherlands, earlier. Measuring 994 feet long, 136 feet wide, and at a gross registered tonnage of 168,028, she embarked on her journey down the Ems River and up to the North Sea in reverse, making the narrow passage through Meyer Werft’s sea lock, with less than four feet clearance. This very careful manoeuvre took about two hours at a speed of only 0.2 knots. The precise navigation included a team of experienced Ems River pilots, navigation officers, the yard captain and the local German waterway authorities. After passing through the sea lock, Norwegian Bliss continued along the river stern first, which helps with the manoeuvrability of the ship and is a key component when navigating her through such narrow passages. When she arrives to Eemshaven, she will take on additional provisions and crew members, before heading toward the North Sea for technical and nautical sea trials. 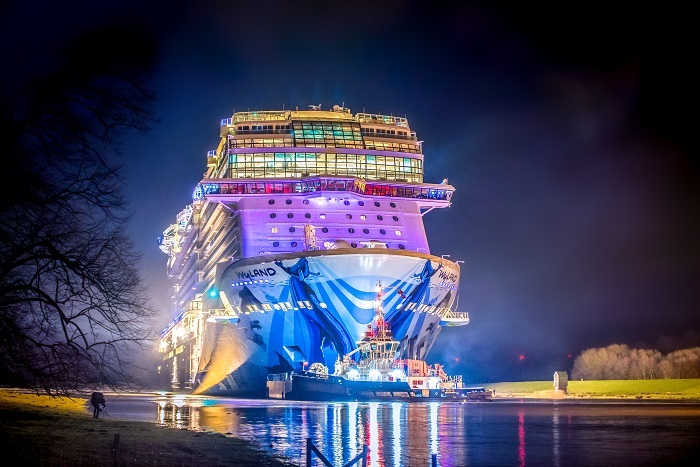 This will be one of the final phases, before Norwegian Cruise Line takes delivery of their sixteenth ship on April 19th in Bremerhaven, Germany. Norwegian Bliss will then begin her passage across the Atlantic Ocean on April 21st and will arrive to the US on May 3rd, where she will begin her inaugural tour, the most extensive of any ship in Norwegian Cruise Line history.